There are many pictures here so I've placed them after most of the text so you'll have something to read while they're loading. The links above are to different pages, not what follows below. If you want to see moose, go north on Route3 to Pittsburgh or over to Berlin and north on Route 16 towards Maine. Both of these areas are sort of "moose alleys" and there's about a 90 percent or better chance of seeing one there. Since the area is full of them, you might chance upon one anywhere though. We've seen a few on Route3 North of Lancaster, a few years ago had one in our back yard, in the middle of town. Last year a big bull moose passed through our lower driveway. Another one trounced through one of our flower beds last month (June 1997). Fortunately it missed all the flowers. Be watchful at night on Route3 by Weeks State Park for deer. Moose have been becoming a real problem in northern New England. They have an amazing ability to find themselves in front of cars in the middle of the road. Full grown they weigh upwards of 800 to 1000 pounds. (A moose charged a locomotive head on in Crawford Notch a few years back, and derailed the train. The moose staggered off before it died.) Our local barber has a picture of one standing on the hood of a car occupied by a somewhat surprised elderly lady. When you visit our area, please drive carefully. Be on the watch after dark for any change in the shades of the shadows beside and in the road. Watch for beady, yellow eyes way up in the air. If you see one standing there, don't walk up to it. They might just stand quietly, and let you pet them, or they might rear up on their hind legs, and come crashing down on you with their front hooves. They may be big and dumb, but they can be very fast. When we moved up here my wife expressed a desire to see a moose. At the time my employment caused me to drive a great deal and I encountered more of the things than I wanted to. In fact the first night on the road I had to swerve to miss three of them on route 110 in Stark. 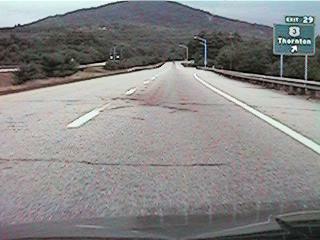 Later that night there was a big bull moose in the middle of route 16 at the south end of Pinkham Notch. I stopped the car, and wondered what to do. Didn't want to beep the horn as it might make the thing mad and cause it to charge. I looked around the car. There was an old broom in the back, so I plucked it out, got out, and cautiously approached Bullwinkle. Gave it a good whack on the rear end. It didn't even flinch. Another whack. Still nothing. Went back to the car. Figured dogs don't like newspapers, maybe moose don't either. Rolled up the Boston Globe. (At least it's good for something). I don't know if it was all the hot air in the Globe or what, but when I struck the behind of the moose, he took off like a shot! For the rest of the fall almost every night I found him on the same curve. I'd pull out a paper, slam the side of the car with it, and he'd take off. Anyway, back to my wife wanting to see a moose. Several years went by and still no moose for her. Then one afternoon we went for a ride up the Nash Stream road. While on a side road that really wasn't meant for a Ford LTD II, a ball joint broke. We got a ride back to town, bought a new ball joint and headed back to replace it. I was putting it back together at about dusk with the wife sitting in the other car. Suddenly she yelled, "you'd better get in the car!" I was at one of those points in a project where looking up or doing anything else but continuing isn't much of an option. She yelled again. I just cussed a little under my breath and kept working. Then I began to feel the hot, humid breath on my back. I very slowly turned just my head so I could just see what was there out of the corner of my eye. It was one of the larger moose I've seen with a huge rack seeing what the humans were doing. After a few moments it decided to check out the other car. While it was slobbering over the window my wife was sitting behind, I carefully got in the Ford. A few minutes later it went on down the road. As it was getting dark, we decided to return the following day to finish the job. It took about another 15 minutes to go about a mile as the moose wouldn't get out of the road, but kept moving along from a slow walk to a fast trot for the next mile or so. The wife was happy, sort of anyway. She hadn't really wanted that close a view of a moose, but at least this had been a fine one to see. you walk in the woods. 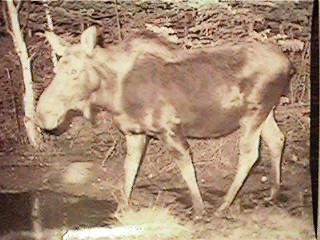 About mid-June 1997 I came upon a big bull moose running full tilt in the grass beside route 3 just north of Franconia Notch. I slowed down to clock it. It was doing about 40 MPH, and was still running when I left after several hundred yards. 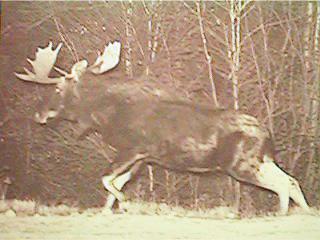 Here's a picture of what could be the same moose I took a few years ago, probably around 1994. What you see here is exactly what it looked like in June 1997. And a young moose. About 1993 I began meeting the three of them almost every night in the same spot along route 3 in Bethlehem. 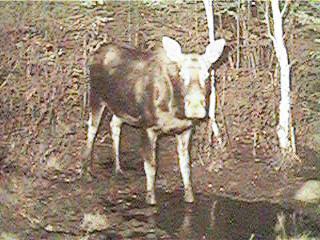 There is a "moose wallow" about a half a mile south of "Last Chance". 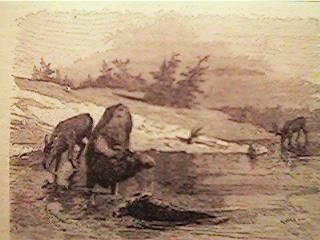 They stomp around in the wet ground there until it's muddy to get at the water that has a lot of salt in it from the winter. And a female moose it had been hanging around with. I've come across several moose/car/truck encounters. About 2 AM one day I was following about a mile behind a Chrysler product Caravan from Connecticut on I-93 north between Ashland and Plymouth. They were about a mile ahead on a long straight stretch, when all of a sudden I saw their headlights and tail lights spinning around in the middle of the road. They came to a rest on the side of the road pointing north again. The road was dry, warm out, no ice. I was quite curious what had caused such an event. 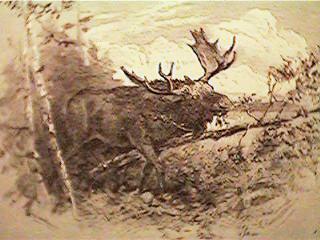 Upon reaching them, there was a big bull moose dying in the passing lane. The folks were just getting out of the van, rather shook up. He mentioned it was just 2 weeks old. His left thumb had been cut by flying glass, didn't appear to be any other injuries. A friend of mine arrived a few minutes later, and we hung around to direct traffic until another person summoned the police. The van had minor damage with the driver's side windshield pillar bent in a few inches and the windshield crackled. 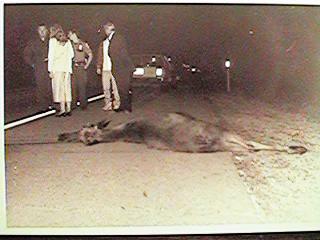 The folks had been doing about 70, so they were lucky enough to have the moose thrown and slid over the top of the van. Another encounter with a moose on I-93 just north of the Meredith exit was a small pickup that had struck the left front leg of one and broke it completely off at the knee. A policeman stopped a few minutes later and finished off the moose. The truck suffered a bent fender and a smashed headlight. Here are a couple of pictures I took at the moose encounter scene. 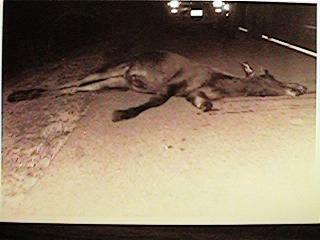 Two more moose hits, within a few days of each other were on route 3 near the White Mountains Regional High School. In one, a Lotta Rock Dairy truck and a moose were both towed away, another involved a mid sized sedan, again, both were towed. This blood spot is near the Thornton NH exit. A fellow was killed when his car went out of control during a moose hit. You can click here to see his memorial. 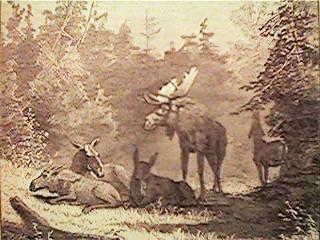 Following are several moose pictures, some from magazines in the 1800s. A moose pushing a small tree over to get at the upper part to eat. Fortunately we've had more logging in the area lately allowing more small trees to grow so the moose have something to eat. When the forest is left to grow without harvesting trees, after a few years there are no longer the small trees and plants the animals need to survive. All that will remain is large trees which shade out everything below and the animals starve. A "moose yard" where several moose are bedding down together. 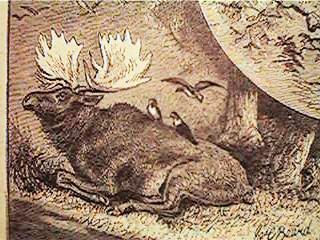 Birds in a symbiotic relationship with moose picking off and eating insects. 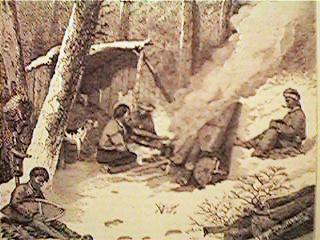 Indians camped while on a moose hunt. Notice the snowshoes the one in the lower left is working on. These are wooden frames laced with woodchuck leather or other animal parts. They distribute your weight over the snow so you can walk on deep snow without sinking in much. 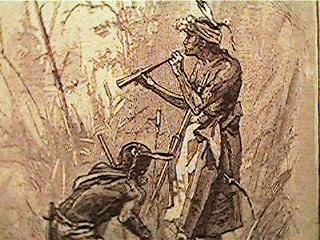 This was an invention of the Indians, who knows how long ago, that they shared with the white men when they arrived in Canada. Calling a bull moose while on the hunt. A tube (usually of birch bark) is rolled up and a noise like the call of a female moose is made. Any male in a raduis of about 5 miles will come running. This is a "sure fire" way to attract a moose, but dangerous. When he arrives and discovers no female, he's going to be mad. Come to the annual Moose Festival in Colebrook to hear the moose calling contest! If two males arrive this can happen. 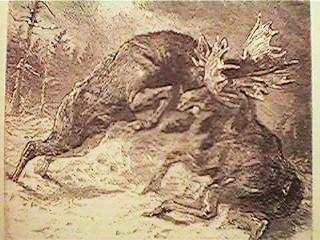 Male moose are more than willing to fight over a female moose, a battle sometimes to the death. People have found moose antlers in the woods that were locked together in combat with the moose starving to death afterwards. Moose at a body of water. Moose can swim very well, in fact the first moose I ever saw, probably back in 1977 or so was swimming across Rangley Lake in Maine. When we go canoeing in shallow water in the lakes and ponds around Lancaster we often see "sign" of moose on the bottom. Sort of greenish or brownish things about the size of meatballs. (Moose crap). I understand there's someone over in Maine who gathers the stuff, coats it with urethane or something and makes necklaces out of it. 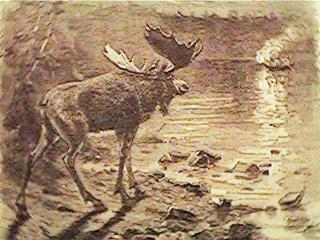 A moose by the shore of a lake or pond watching a boat approach. E-Mail: edsanders@edsanders.com Copyright 1998, 1999, 2000 by Ed Sanders.